Sakurajima is erupting in this photo – you can just see the white clouds emerging on the far side of the mountain. The people who live in the villages around the foot of the mountain must be quite brave, as there’s a constant risk of landslides caused by build-ups of ash on the mountainside, and small stones sometimes come raining down without any warning. Just a couple of kilometres across Kagoshima Bay from the city of Kagoshima lies Sakurajima, one of Japan’s most active volcanoes. Its last really big eruption was in 1914, when it spewed out lava for months on end, destroying hundreds of homes. (Thankfully the residents had enough warning to get out of the way in time.) 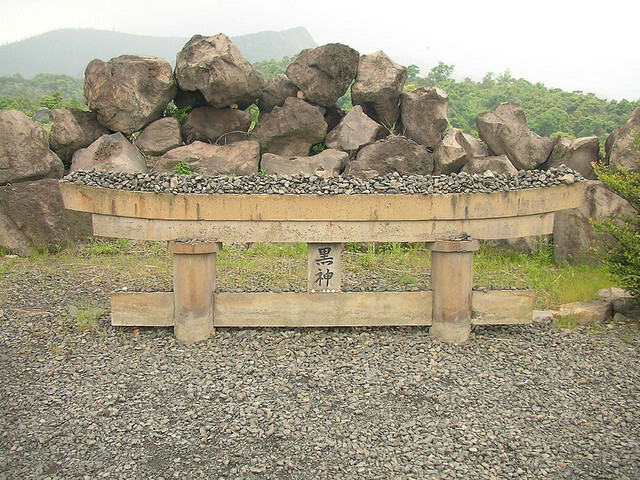 At Kurokami Shrine, you can still see the top third of the shrine gate sticking out of the ground – the bottom two-thirds, and most of the rest of the shrine, were buried by the eruption. Sakurajima seen from Kagoshima. The city’s residents are used to the volcano erupting almost every day, often covering their town in a blanket of ash, but this eruption in 2009 was bigger than most. Sakurajima literally means ‘cherry blossom island’, but as during this eruption it became joined to the mainland by a lava flow, it’s not really an island anymore. While the lava stopped flowing long ago, Sakurajima has been erupting almost non-stop since 1955. You might think that this would have deterred anyone from living nearby, but around 7,000 people live on the volcano, partly to take advantage of the super-fertile volcanic soil. 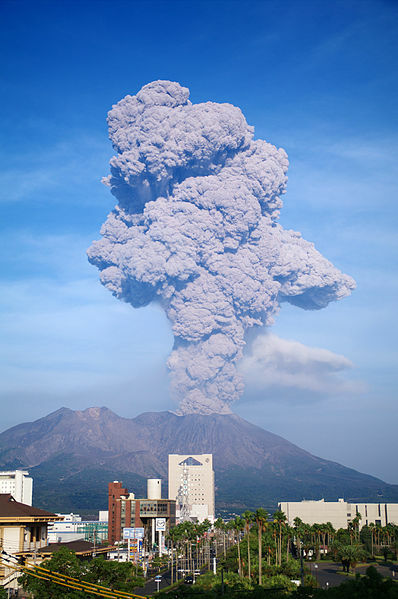 Most days Sakurajima sends clouds of ash high into the sky, and sometimes it throws out rocks as well. This debris rains down on the surrounding area, including the 600,000 residents of the city of Kagoshima. As a safety precaution, local children wear helmets when they’re out of doors, and there are shelters around the island and in Kagoshima City where you can take refuge during eruptions. You can’t climb to the top of the volcano, but there is a road all the way around the island, and several lookout points that provide great views of the volcano. It’s about 36km to go right around the island, so it’s a bit far to walk, but you can rent both cars and bikes from the car rental office near the ferry terminal, and there are twice-daily bus tours. In a couple of places walkways have been built across the lava flows from the 1914 eruption, allowing you to explore this alien landscape. If you feel like relaxing, there are a couple of hot springs in which you can bathe – they are a side-effect of the volcanic activity that’s much appreciated by locals and visitors alike. The best place to start exploring is at the Sakurajima Visitor Centre, about ten minutes walk from the ferry terminal. You can get an idea of the scale of the 1914 eruption from this gate at Kurokami Shrine that was almost totally buried in lava.